A magnified (400x) view of a sliver of Upper Devonian Period fossilized wood. It is probably Callixylon found in the New Albany Shale of Clark County, Indiana. While this area was a sea with anaerobic bottom, it is thought logs floated in from Pennsylvania or New York and sank. Buried in the silt they fossilized instead of decomposing. 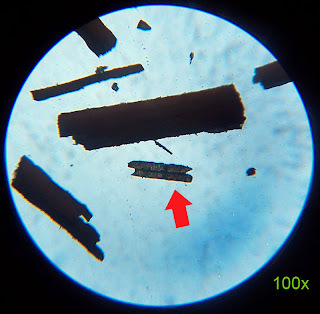 While trying to get a sample for the scanning electron microscope some very small thin pieces broke free. They were transparent enough to use the optical microscope's bottom light thus able to achieve 400x magnification. How to determine what material is represented by that optical pattern I am not sure. 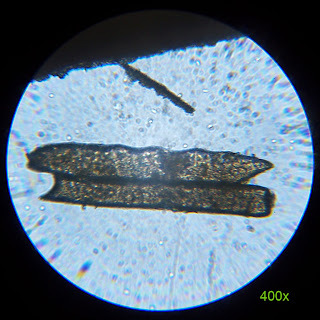 I assume it is a fragment of two wood rays. Last picture original fossil fragment originated from. 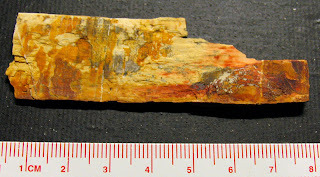 This piece differs from yesterday's fossil in that it is not coalified. Thanks to Herb for the specimen.